This article is intended as a primer for collecting Second World War (SWW) Canadian cloth shoulder insignia. This paper will focus on cloth shoulder title insignia, with comments on formation insignia as relevant. The cloth shoulder title evolved during the war years, becoming a ubiquitous feature of the battledress uniform. Formation patches (Brigades, Corps, and Divisions) also underwent major changes during SWW as the army would institute then discontinue complex distinguishing signs with imposed corps or regimental abbreviations on the formation patch. Eventually a plain formation patch without any imposed lettering became standard issue. This was worn in combination with the regimental or corps shoulder title. The overall goal of insignia policy for the Canadian Army was to produce descriptive insignia that were useful to enhance moral and indicate the soldiers’ affiliation, both for the military units and higher command. By the end of the war, Canadian army personnel could be quickly and easily identified by a glance at their sleeves. There, with pride, they wore their shoulder title and formation patch. Slip-ons were embroidered in black thread on either a worsted woven wool material or on a khaki drill material. Slip-ons were designed for easy installation and removal. The title was a trapezoid shape with a thin cotton backing with two straps sewn on the reverse designed to slide over the shoulder strap. The abbreviated unit name was embroidered on the slip-on. There were some variations of slip-ons patterns, either unofficially produced in Canada, or procured in Great Britain. Worsted Canadian authorized slip-ons were issued starting early in 1940. With the authorization of coloured shoulder titles in late 1940, the active army discontinued the wearing of slip-ons. No worsted slip-ons were officially acquired overseas. From 1942 until the end of the war slip-ons were the only authorized pattern of title for wear by the reserve army. Canadian pattern worsted slip-on. Attachment tapes made of cotton. Raymond Gilbert. Felt is made of compressed fabric particles, rather than the woven threads of wool. When examined under magnification, there is no weave pattern but rather a jumble of threads. Manufacturing companies produced most felt insignia without backing. Some felt titles/patches were acquired early in the war, some Canadian made, and some British manufacture. Canadian felt titles were usually produced by spraying or painting the designation on the title. This process is sometimes referred to as “flocking” or “painted”. Felt was less durable in wear. These titles quickly faded and fell apart in use. Late in the war a British made issue of felt titles for Canadian units appeared overseas. These were embroidered on felt and coated on the reverse with a sizing or glue compound, thus the name ‘starch-backs’ or ‘glue-backs. No documentation has been found authorizing the official acquisition of this pattern of title. Melton is a tightly woven wool fabric with heavily brushed nap giving the fabric a smooth finish. This fabric had letters, numbers or designs embroidered in silk thread on the body of the title. One method of distinguishing a melton patch from a felt one is by examining the edges of the cloth with a magnifying glass. With melton, one will see threads of wool along the edge. In contrast, the felt edge is smooth and devoid of rows of threads. Wool was a controlled material during the war, which meant that the fabric for making shoulder titles and formation patches was restricted in quantity and difficult to obtain. Embroidery was to be done in silk thread, but some substitution with cotton thread appears to have been made. 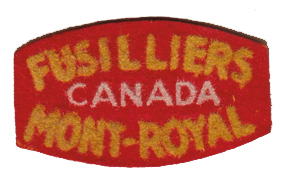 Coloured embroidered insignia were initially authorized for wear by overseas units only, but in 1942, authorization to wear coloured embroidered titles was extended to active service units in Canada. By the end of the war, all active force units in Canada were wearing coloured embroidered melton titles. 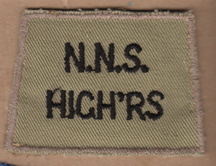 Some reserve units acquired and wore unauthorized coloured embroidered titles. When the army switched to printed titles overseas, existing inventories of embroidered insignia were to be used up before printed were issued. Embroidered insignia was also allowed if the delivery of printed titles was delayed. Many units had both issues in use at the same time. 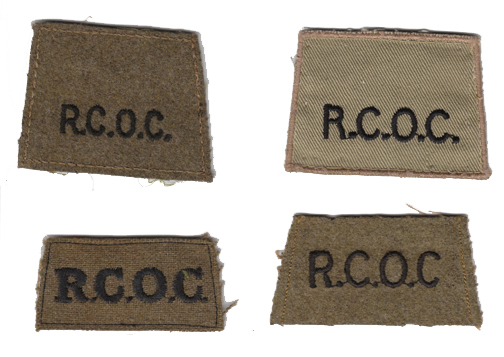 Embroidered titles were authorized and some titles were acquired for units of the CAOF (Canadian Army Occupation Force) over the summer and fall of 1945. Canvas titles were the product of a fabric screen printing technology. The design was made using a series of meshes through which pigments were forced to produce a finely detailed printed fabric. Printed on a cotton twill material or cotton satin material these patches were of a two piece construction. The printed obverse fabric was bonded to a cotton backing. The edges were sealed to minimise fraying. Many printed designs were direct copies from melton patterns submitted by regiments and corps. Others were new designs. Only one maker, Calico Printers Association, produced the printed titles and patches in the United Kingdom. Printed titles only exist for units on the order of battle for the overseas army. The Canadian Forestry Corps overseas insignia was a triangular patch. The Canadian Women’s Army Corps (CWAC), and the Canadian Intelligence Corps did not have printed titles. 1 Canadian Armoured Carrier Regiment (1 CACR) was not authorized regimental titles through the Royal Canadian Ordnance Corps (RCOC) system. Shows the approximate time during the Second World War when each type of shoulder title was introduced and used. In late 1942, the Canadian Army (Overseas) authorized the switch from embroidered patches to printed cotton. From that date, the only officially authorized Canadian army overseas insignia was printed insignia. This policy remained in force until the end of the SWW. Units were required to use up their holdings of melton titles and patches before issuing printed insignia. After investigation, it was found that printed titles could not be produced in Canada. The only feasible method of production available was embroidered melton titles. Embroidered wool titles would be the only official issue to the army in Canada for the duration of the war. Cloth titles, because of the harsh wear and suboptimal washings, were required to have the following characteristics: durability, low production costs, resistance to colour fading and loss of shape. Excessive fraying of the edges was not acceptable. Meeting all the criteria with only one of any of the above materials was an unattainable goal. Approval to wear worsted slip-on titles was granted in late 1939, but no officially authorized slip-ons were procured until 1940. Immediately, it became apparent they would be obstructed by equipment and damaged by the rifle and field use. Identification of the unit was difficult. Alternatives were quickly sought. They were allocated to use by the reserve army in 1942. To adopt coloured shoulder titles, each regiment or corps submitted a proposed design, which embodied or symbolized the name and history of the unit, to National Defence Headquarters (NDHQ) for approval. If overseas, designs were submitted to the Senior Officer Commanding Combatant Forces for approval. Once approved, contracts were tendered, sample titles submitted, patterns sealed, titles manufactured, and then sent to ordnance depots for distribution to units, where they were issued. The scale of issue for each soldier was 6 shoulder insignia, 4 for battledress use and 2 for the greatcoat. 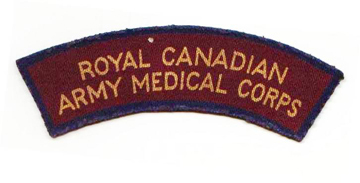 In the case of corps shoulder title insignia, (as in the Royal Canadian Army Medical Corps, Royal Canadian Army Pay Corps, Royal Canadian Engineers, etc. ), the same procedure was followed. 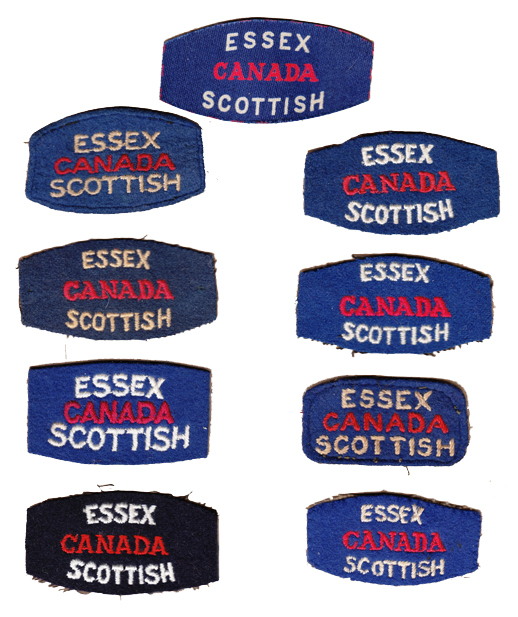 Many companies in both Canada and Britain produced embroidered wool insignia for the Canadian Army. Some of these companies had army contracts; others were a private purchase by a military unit, or by individual soldiers. As wool was a controlled war material, and embroidery was a time consuming production method, the army looked for a more economic way to acquire the vast quantities of insignia that were needed. Alternatives were sought, and the product produced by Calico Printers was examined. Canadian Military Headquarters was satisfied that their printed canvas badges met the criteria for useful insignia. Canadian made “imposed” formation patch for 3 Canadian Infantry Division, Canadian Dental Corps. Raymond Gilbert. Printed titles were not popular. Some service personnel felt that they didn’t stand up well to washings and faded in sunlight. Some Canadian soldiers trimmed the new canvas patches for their uniform. This removed the factory bonded edges, resulting in fraying. Whatever the issues, printed titles were much cheaper and quicker to make than the embroidered ones, even if they had to be replaced more frequently. They remained the official overseas insignia until the army left the United Kingdom. Two other factors impacted the issue of shoulder titles. Many units had their designations changed over the course of the war. 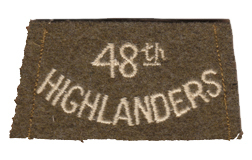 The Cameron Highlanders of Ottawa started the war with the designation M.G. (Machine Gun), lost the designation mid-war and then regained the same designation later in the war. Appropriate titles were authorized and made to reflect these designation changes. Other units that experienced designation changes during the war also obtained new issues of titles. When shortages made official issues impossible, or when personnel wanted to “dandy” up their battledress, soldiers being soldiers, they obtained tailor made or private purchase insignia. These patterns are difficult to document, and the provenance must be established on a case by case basis. The following is a list of some of the major characteristics of shoulder titles. The list is by no means exhaustive nor exclusive. Canadian embroidery machines made a horizontal stitch. All canvas patches and titles are UK made and were made under the authority of the Canadian Military Headquarters in the UK. There are two exceptions to this rule. The printed Kiska patch was made in North America. It is completely different from overseas printed insignia. The provenance of the Canadian Army Trades School printed patch has not been documented. Thick letters on the insignia suggest SWW vintage. Most embroidered shoulder titles have some sort of backing material. Black or tan/ khaki cotton backing material is the most common. Some have a paper, or padded backing. On occasions the soldier modified the backing. Unfortunately, Canadian cloth shoulder titles have been subject to extensive reproduction, and questionable titles are entering the market on a regular basis. With the increasing value of shoulder titles, a collector needs to be wary when acquiring titles. A thread from the patch will burn with ash if it is a natural fibre. If the fibre melts it is synthetic and so the insignia was made with post-war synthetic materials. The thread glows under ultraviolet light (‘black light”), which means that the thread is synthetic and post war. Caution should be used with this technique. Modern cleaning may have left traces that glow. The designation on the title is not appropriate to the time period. The embroidery doesn’t go through to the backing material. There are notable exceptions to this guideline; for example, some Régiment de la Chaudière and Highland Light Infantry SWW titles do not have the embroidery thread through the backing. Sunlight/light, moisture and heat are the enemies of cloth. Cloths should be stored in cool, low humidity areas out of bright light. Avoid exposing cloth to direct light for long periods of time. Extreme caution should be used when working with or handling cloth. Dirt is an enemy of fabric. A gentle cold water rinse to remove soil may be necessary, with air drying. Mounting: In the past many people have used various glues to paste the insignia into books or photo albums. Today most collectors leave the patch free or use masking tape or double-sided tape for mounting. Acid-free photograph hinges are an alternative. Plastic, if used to cover the cloth, should also be acid-free. Mounting surfaces or card stock, if used for mounting, should be acid free materials. Old glue: If desired this can be carefully broken off by gentle folding or rolling the cloth and the glue will crack into smaller pieces which can be picked off. This method will not likely remove all the glue. Certain types of glue may be removed using Zero and cold water. Rubbing alcohol or chemicals can also remove glue. The cloth should be tested first in a small area before applying these more aggressive agents. If the item in question is rare, it may be wise to approach a professional conservationist for preservation advice. Canadian Second World War insignia is a fascinating area of militaria collecting. Establishing the proper issue of insignia for the time period is a challenging and confusing exercise. The information provided in this overview is intended as an introductory guide to the cloth shoulder titles issued in the Canadian army. 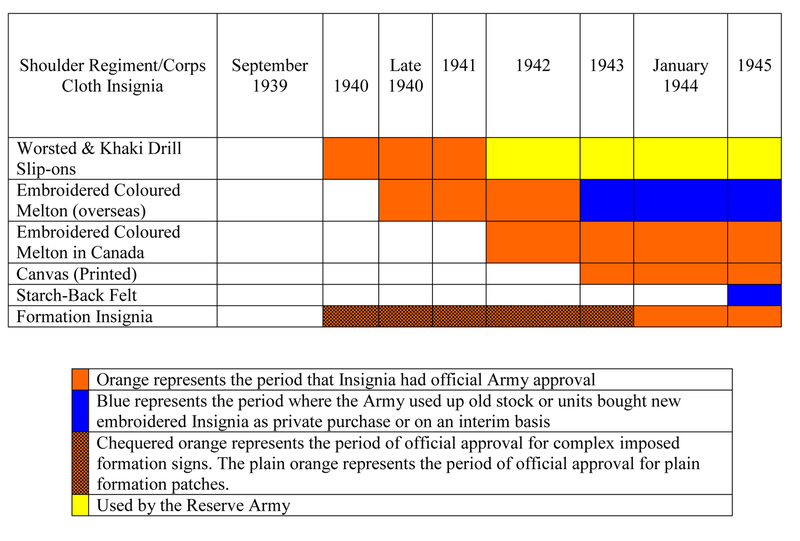 Research into the history and deployment of units can assist in documenting the evolution of the insignia for particular regiments and corps. The information in this article is derived from the documentation held in Library and Archives Canada, Record Group 24, Various Volumes and Files.